Rare sand dunes on the Aberdeenshire coast are likely to be stripped of their status as a protected nature conservation area because they have been ruined by Donald Trump’s golf course, experts say. The government wildlife agency, Scottish Natural Heritage (SNH), is reviewing whether Foveran Links at Menie can remain a Site of Special Scientific Interest (SSSI) because of “loss and damage” caused by the Trump development. Leading coastal ecologists, including one of Trump’s former advisers, are warning that SNH will have to scrap or redraw the designation. This would remove any legal protection against further damage, and could have implications for another controversial golf course planned on an SSSI in Sutherland. SNH has told the BBC and The Ferret that it is aiming to complete a review of the boundary of the Foveran Links SSSI by the end of December. “This will include assessing how the construction of the championship golf course has altered the SSSI,” said an SNH spokesperson. It's been ruined from a virgin, undeveloped wilderness site, into something that's relatively manicured. Dr Jim Hansom, a coastal geomorphologist from the University of Glasgow, would be very surprised if the site survived as an SSSI. “It really should be de-notified because there’s no dynamism involved in that site now, and that was the original justification for its notification,” he told a BBC Scotland documentary due to be screened on 9 November. He was backed by Dr Tom Dargie, a sand dune expert who was hired but then ignored by Trump in 2008. “From a look at satellite images, Dr Hansom is probably correct and de-notification is likely,” he told The Ferret. Dargie is now heading a local group opposing plans by another millionaire US developer, Mike Keiser, for a golf course at Coul Links near the village of Embo on the Sutherland coast. “De-notification is also likely for SSSI ground at Coul Links, where the habitat destruction will be almost 50 per cent greater than on the Trump course,” Dargie said. According to the Scottish Wildlife Trust, Trump’s golf course could have caused “severe and irreversible” damage to about 40 per cent of the Foveran SSSI. “It would be unsurprising if the SSSI status is removed,” said the trust’s chief executive, Jonny Hughes. The Scottish Government gave Trump planning permission to build his golf course on the Foveran SSSI in 2008 in the belief that the economic benefits would outweigh the environmental losses. But promised £1 billion plans for a second course, a 450-bed hotel and nearly 1,500 homes have yet to be built. So far the Trump organisation has invested £100 million in the development, though it says there’s more to come. 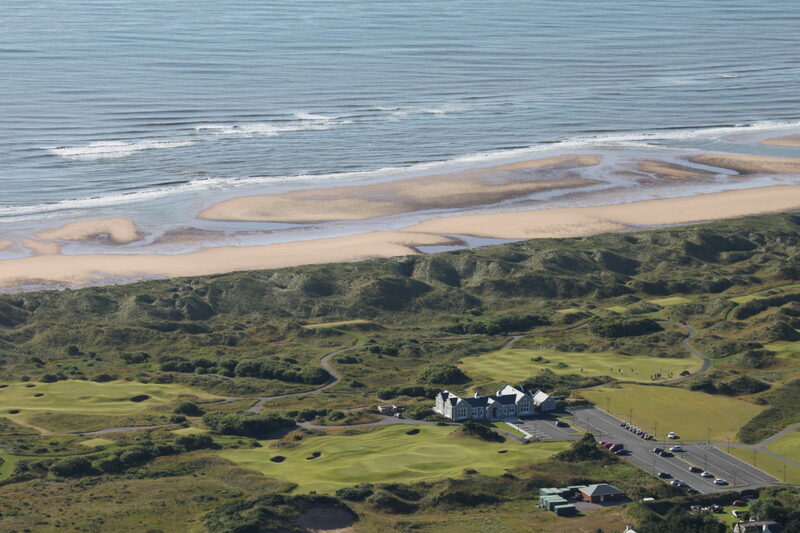 As well as the golf course, it has built a clubhouse, a 16 bedroom “boutique” hotel and some lodges. The SNP’s former First Minister, Alex Salmond, has accused Trump of breaking his pledges to invest in Scotland. “The people who were putting it forward did not live up to and honour the agreements they made to the Scottish people,” he told the BBC. Salmond, who as the local MSP originally supported the golf development, thought that the Trump organisation now faced “the most enormous credibility problem”. It would have difficulties persuading Aberdeenshire councillors to believe its commitments given its track record over the last ten years, he claimed. Trump International Golf Links Scotland has submitted a planning application for a second golf course, though it’s facing environmental objections. The organisation says it still has plans for 550 residential and holiday homes but has dropped the idea of a hotel because of changed economic circumstances. The Conservative leader of Aberdeenshire Council, Jim Gifford, who has always supported the Trump development at Menie, admitted that at the moment it hadn’t been worth the environmental damage. “The economic benefit hasn’t come through,” he said. He wanted Trump to finish the job. “I think they have an obligation to bring forward what they promised, that’s the bottom line of it. The difficulty we have is we can’t force them to do that”. The Trump organisation said that the future of the SSSI was for the authorities to decide. “I don’t think it matters to us,” Trump’s Scottish spokeswoman, Sarah Malone, told the BBC. She described the site as “breathtaking” and insisted that Trump had gone to great lengths to ensure it was woven “seamlessly” into the landscape. “The fact of the matter is, contrary to what is propagated by a very small group of people, our environmental approach was first class,” she argued. Malone also stressed that Menie was a “multi-phase” development and a long term investment opportunity that wasn’t finished. “This wasn’t going to get built overnight,” she said. This story was updated on 9 November 2017 to add comments from Alex Salmond, Jim Gifford and Sarah Malone. It is being published in partnership with BBC Scotland and The Guardian. Photo thanks to Alanatabz, CC BY-SA 4.0, via Wikimedia Commons.